When I finished my Jacobean Crewelwork module in February, it felt like ages before the start of my next module but now it is only one week away! Even though it will be my 2nd module I am still quite scared about it all. Especially since I will be doing the Summer Intensive course, which will be 11 consecutive days of stitching! On the one hand, I am really like forward to have this amount time dedicated solely to embroidery and not having to go to work or any other commitments but on the other hand, I worry how my mind and body will cope with it all. However, there is only one way to find that out and that is to give it a go! I have, however, decided not to go mad about trying to finish within the timeframe, rush and make a bodge job of mounting and I am definitely not going to do any all-nighters! I can always come back in the Autumn and finish my piece. Fortunately though, I am already ahead by about a day, before I even start, so hopefully that will give me some breathing space. I gained this ‘day’ when I finished my Jacobean Crewelwork in February. It was about lunchtime when I handed it in so I had the remainder of my 8th ‘crewelwork-day’ to make a start on framing up the canvas and choosing my design. During that afternoon tutor Rachel Doyle reminded me on how to attach the canvas to the frame and I got on with that. 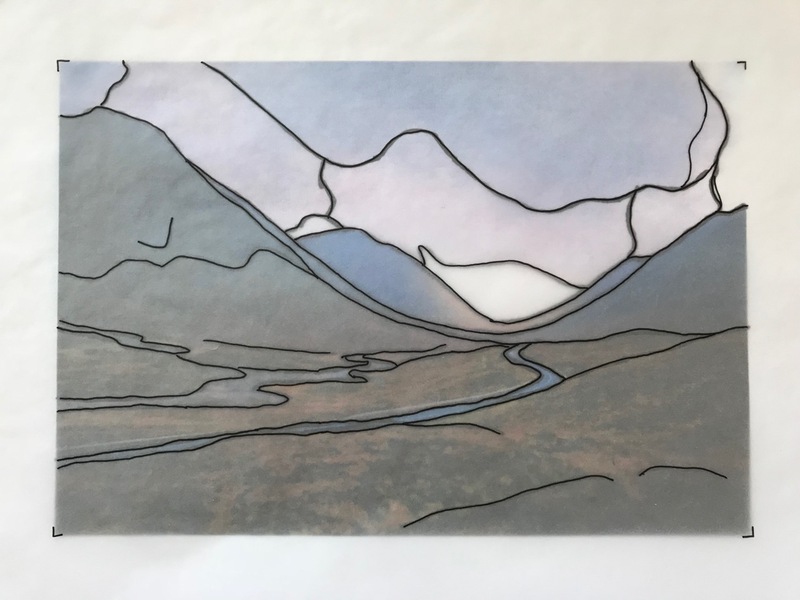 Having already discussed possible design with tutor Heather Lewis the previous Saturday, Rachel agreed with Heather’s advice and my photograph of Glen Coe was chosen as the design. Rachel showed me how to use tracing paper to copy the most important features of the design so I would be able to draw them on to the canvas using a waterproof markerpen! No prick-and-pounce this time around! The outside edge of your design is marked by stitching a running stitch using machine sewing thread. You can’t use a pen to mark the outside edge as those lines might show up on the outside of your finished piece! As homework, I attached the webbing on the sides of the canvas. I temporarily laced it up so I could draw my design onto the fabric. I had originally intended on using my lightbox but with the design framed up, it wouldn’t sit directly on the lightbox, which would have made it impossible to copy. 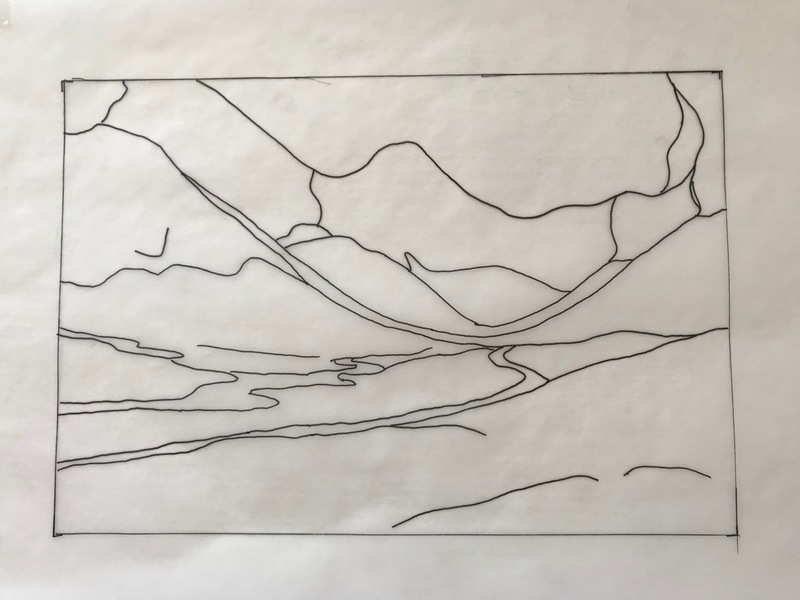 Instead of using the tracing paper behind the canvas to copy the design, I first photocopied that design onto white paper as it made it much easier to see through the canvas. Attaching the white paper to the back of the canvas using tiny pieces of sellotape and balancing it on a pile of books worked perfectly fine. I also tried a few stitches using the threads I wanted to use to see how many threads I would need to cover the canvas. I am going to be using Au ver à Soie ‘Soie d’alger’, Gumnut Yarns ‘Daisies’ and ‘Blossoms’, Headweavers Studio ‘Donegal’ and ‘Blue faced Leicester’, Gloriana ‘Lorikeet’ and maybe some metalics (for the sun), regular DMC stranded cotton and Appletons wool. All that I need to do now before I travel next Saturday is to pack my threads, embroidery tools and a few books and roll up my canvas and I will be all set to start on Monday the 9th. I probably won’t have much spare time to be blogging about the course while I am there, but I will keep you updated on social media and I am also going to have a go at Instagram stories to give you an insight into my days there. So look out for those! I will be writing a blog post, or maybe even a couple, about the course when I have returned home. Looking forward to meeting those of you who are attending the Canvaswork (or Blackwork) module! Do let me know in the comments below if I will be seeing you there! Just happened upon your blog whilst trying desperately to find trestles. I am half way through my Jacobean module, so it’s really interesting to find a kindred spirit doing what I’m doing but slightly ahead. Your design looks wonderful. Thank you Maureen. I hope you have found my post on the trestles usefull! Good luck with your certificate! Hope you keep following my blog! Great to see all your preparation for Canvas work, you really do have a head start on the students who will be commencing on Monday. We were told today that there will be one classroom of all the Canvaswork students and one classroom of the Blackwork students, as they have sufficient numbers to organise this way. See you next week! Thank you, hopefully the head start will pay off. Thank you for finding that out. I am usually early in the morning so I’ll see which room I need to go to. Do you know who the tutors will be as I presume there will be more than the original two? I believe that it is Jen Goodwin for Blackwork, and Lisa Bilby for Canvaswork- though of course things can change. The office told me that my tutor will be Helen Jones. As she didn’t say two names I presume that there only a maximum of 6 canvaswork students and that the other three tutors are for blackwork. See you later this morning! Good luck! It’s a lovely photo, and I hope you enjoy it. I’m interested in hearing your thoughts on the intensive, as that is how I will be doing it from now on! Thank you! I will keep you posted and give you some inside info! Love the colours in your photo – good luck and enjoy stitching! Thank you! I am hoping I can get them to come across in thread, as it is very difficult to match the exact colours. I have got some lovely greens, oranges and dark blues for the hills and lilacs and blues for the sky so hopefully they will work. Looking forward to seeing your progress, and your musings once you get a chance to catch your breath! I’ll keep you updated as much as I can as I am probably in need of some moral support along the way! Spannend Marlous. Heel veel plezier gewenst. Dankjewel Will! Hopelijk is het over drie weken te zien! Thank you Stephanie! I am going to try and do a diary thing on Instagram stories but bare with me as it will be my first time using it. Do let me know if you have found it useful! Thank you! I will enjoy stitching this design so much more as I have my own memories of this particular scene, rather than having to stitch something someone else has chosen for you. I have already packed a packet of plasters! I will definitely need them when mounting canvas! Oooh, ouch. Glad you’re prepared!